Just think about it. His name is Slimane, pron0unced “sleh-MAHN” because it is French. An etymology website I found after googling “etymology” tells me that “slender” comes to modern English from the late 14th century “sclendre,” of French origin. You know what else is of French origin? 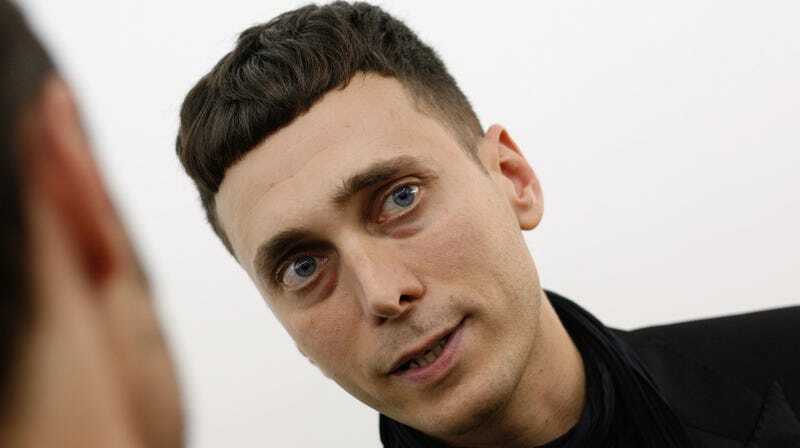 Fashion designer and Celine creative director Hedi Slimane. That name… Slimaaaaaane… Go ahead. Roll it around in your mouth like a handful of ham marbles. Slimaaaaane. Sli-mane? Sli-man? Slim—man? Slim? Synonym of skinny? Trim? Lean? Slender? Slender-mane? Slender-man? Slenderman? Slenderman. Add the numeric value of all 10 letters, and you get 105. Do the same with “Hedi Slimane,” and you get 99. Add those two numbers together, and you have 204, which, when rendered as a calendar date, falls on the first week of February, which is when Hedi Slimane began running Celine earlier this year. Subtract 99 from 105, and you have 7, the slenderest number this side of 1. If Hedi Slimane weren’t Slenderman, why would subtracting the numeric value of his name from the word “Slenderman” equal such a skinny number as 7? I’m not saying this proves anything, but it has given me a lot to think about it.